The monochrome wash drawing (illus. 1) at the center of this essay has had an interesting career since it first came to public notice in 1974. *↤ This essay is dedicated to Dr. Elizabeth B. Bentley. I am grateful to Warren Cariou, Alexander Gourlay, Sarah Jones, and Joseph Viscomi for their suggestions, and to John Sullivan and Devonne Tice of the Huntington Library for their assistance with electronic imaging. No one has seriously doubted that it is a portrait of William Blake, but its authorship has remained an open question. The first reasonably definite attribution, proposed by a distinguished art historian, has received less than universal assent. Perhaps this mystery, coupled with the hypnotic and hieratic character of the drawing, has contributed to its becoming one of the most reproduced, and hence most familiar, representations of Blake’s visage. My purpose here is to argue that this work is a self-portrait, a view that has been noted in several earlier publications but not presented in detail. My proposal is clearly self-serving, since I own the drawing. Consequently, I have hesitated to publish my views on the portrait’s attribution for over 30 years.1↤ 1. I have been less restrained in conversations and correspondence with people who have requested photographs of the portrait. It is time to come clean. I trust that my arguments will be judged on their merits rather than their source. The detailed “review of previous research,” once standard in scholarly articles, has in recent times been honored in the breach. I’ll return to that antiquated genre to set my opinions in context. This overview of almost everything that, to my knowledge, has been written about the portrait may also provide some general insights into the vagaries of reception history, the rhetoric of attribution, and the relationship between material facts and the connoisseur’s eye. The drawing came to light in Christie’s London auction catalogue of 5 March 1974. Accompanied by a black and white illustration, lot 77 was ascribed not to an individual, or even to the ever-productive “Anonymous,” but to “Circle of William Blake” and titled “Portrait of the Artist.” Anticipating an after-sale dispute over the identity of either the artist or the subject, Christie’s cleverly hedged its bets. The “Circle” is expandable, and might even be extended well beyond Blake’s lifetime, and there are of course men other than the artist and poet with the name “William Blake.”2↤ 2. See the account of other William Blakes living in London, 1740-1830, in G. E. Bentley, Jr., Blake Records, 2nd ed. (New Haven: Yale UP, 2004) 829-45, hereafter cited as “BR (2)” followed by page number. The “Artist” portrayed might be anyone in that circle, not just the person at its center. In spite of Christie’s quibbling rhetoric, I was immediately taken with the image and believed it to be a portrait of the engraver, artist, and poet William Blake, although at the time I had no idea as to its creator. The catalogue description included the following point: “on paper watermarked G. Pine 1802.” The name of the paper manufacturer is incorrect, as I will discuss below, but the date is both correct and significant. Watermarks provide only a terminus a quo, but comparison with some known portraits of Blake convinced me that this work, with some idealization and added youthfulness, might well be datable to c. 1802-04, when the man was 44-47 years old. My interest, however, had little to do with reasoned arguments and facts. My immediate response, aesthetic and subjective, mastered other considerations. Even though my instincts were based only on the catalogue reproduction, having never seen the original, I commissioned the London firm of Baskett & Day to bid for me, and was successful at 800 guineas (then about $1930). I was not the only Blake enthusiast interested in the drawing. Sir Geoffrey Keynes was preparing his catalogue of portraits of William and Catherine Blake and contacted me about his work in progress.3↤ 3. Geoffrey Keynes, The Complete Portraiture of William and Catherine Blake (London: Trianon P for the William Blake Trust, 1977), hereafter cited as “Keynes” followed by page number. With Christie’s help, Keynes had contacted its vendor, a “Mrs. Isaacs,” not otherwise identified. Keynes informed me, in a letter of 4 April 1974, that he had written to Mrs. Isaacs, “who replied that her late husband had bought it at an unknown time & she could tell me nothing.” The provenance trail had grown cold all too quickly. 1. Portrait of William Blake, recto. Pencil with black, white, and gray washes, 24.3 × 20.1 cm. On wove paper with an “[E]DMEADS & PINE / 1802” watermark. Collection of Robert N. Essick. begin page 128 | ↑ back to top but a replica tentatively attributed to John Linnell (illus. 2). Further, “the ‘painterly’ treatment of the coat and kerchief” and, “in the face,” the “somehow cold and brittle rather than bounding and alive” quality of the “otherwise Blakean line” lead Butlin to claim that Linnell is “the most likely author” of the portrait (102). Although he does not say as much directly, Butlin implies that Linnell based the portrait partly on The Man Who Taught Blake Painting in His Dreams, converting it into a portrait of the man whose features were already present in a stylized form in the Visionary Head. Given the watermark date, Linnell was using a rather old sheet of paper. As Butlin points out, however, “the length of time between the date of the watermarks in the sketchbook [i.e., the Smaller Blake-Varley Sketchbook], 1806, and Blake’s use of it in 1819, is not much less than that between the watermark of this drawing, 1802, and the probable date when Linnell would have executed it, c. 1819-25” (102-03).6↤ 6. Linnell did not meet Blake until the spring or early summer of 1818. By 24 June the two men were working together on an engraved portrait of James Upton (BR  340-41). One further feature associates the portrait with Linnell and John Varley, both of whom were involved in Blake’s production of the Visionary Heads and the engravings of a select few in Varley’s Treatise on Zodiacal Physiognomy (1828). “Linnell’s involvement with Varley’s Treatise is particularly significant in relation to the rough sketches on the back of the drawing [illus. 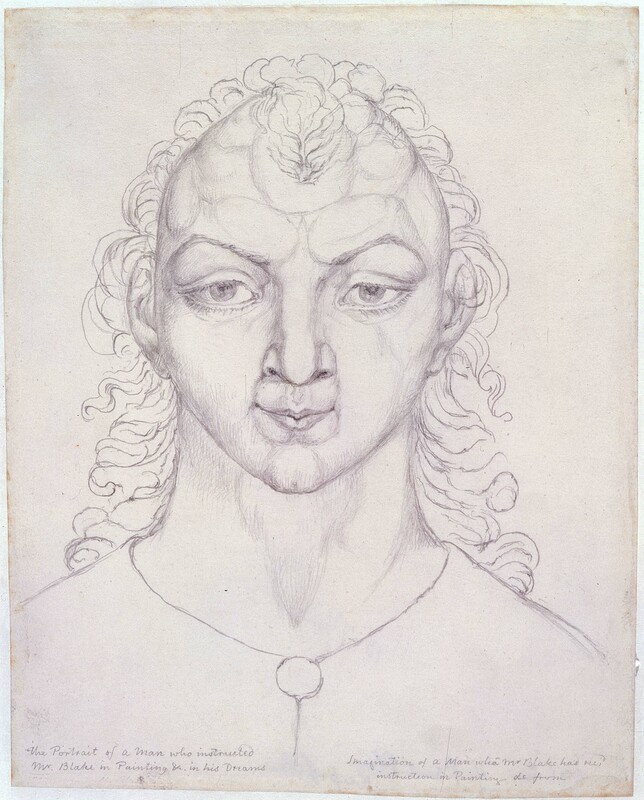 4], which have parallels in Varley’s own work, including the drawings he made in the [Smaller] Blake-Varley Sketchbook before Blake used it for some of the Visionary Heads” (102). I find Butlin’s arguments more compelling for their cleverness, even brilliance, than for the evidence marshaled in their support. Indeed, the main reason for accepting the attribution to Linnell is Butlin’s authority as a skilled art historian who has spent decades studying and cataloguing paintings and drawings by Blake and his circle. As a general rule, the educated eye of the connoisseur is primary; the evidentiary support comes later, not as an inductive method for leading the connoisseur to an opinion, but as a deductive strategy for convincing others that his views are correct. Thus it was with my decision to bid on the drawing, and thus I believe it was for Butlin. By placing The Man Who Taught Blake Painting in His Dreams as an intermediary between the author of the portrait and Blake’s actual visage, Butlin can simultaneously accept the “Blakean qualities” of the drawing and resist an attribution to Blake himself. Unlike the counterproofs and replicas of Blake’s Visionary Heads produced by Varley and Linnell,7↤ 7. They probably used an ocular instrument to produce these copies; see Martin Butlin, “Blake, the Varleys, and the Graphic Telescope,” William Blake: Essays in Honour of Sir Geoffrey Keynes, ed. Morton D. Paley and Michael Phillips (Oxford: Clarendon P, 1973) 294-304. the portrait is not a line for line copy of any preexisting design. Given Butlin’s perspective, the portrait is a complex amalgam of a work by Blake and the man’s actual face—a face that had already influenced the drawing used as a model. Linnell presumably submerged his own stylistic characteristics beneath Blake’s in a pictorial equivalent of ventriloquism, for Butlin makes no mention of any Linnellean qualities in the drawing. The result is a double-likeness, one that captures both Blake’s face and his own conception of that face. But is Butlin’s theory too convoluted, too clever by half? I will return later to his observations, point by point. Keynes’ catalogue of portraits of Blake, containing an almost full-size black and white reproduction of the drawing, appeared only two years after Butlin’s essay and is much indebted to it. After some hesitation, as indicated by the comment that the drawing is “highly finished by a skilled, though not certainly known, hand,” Keynes assents to Butlin’s view with the statements that “the most probable author is . . . John Linnell” and that “it . . . is quite certainly based” on The Man Who Taught Blake Painting in His Dreams (Keynes 24). Keynes adds two observations of his own. “The dress is the same as he [Blake] habitually wore,” but the portrait “was not necessarily done in his lifetime” (Keynes 24-25). Consequently, in his catalogue entry on the drawing, Keynes dates it to “c. 1820-1830” (Keynes 140). He records the watermark, as cited in the auction catalogue, but makes no comment on its early date. Neither Butlin in his essay nor Keynes in his catalogue mentions the possibility that the wash portrait of Blake is the untraced and otherwise unrecorded “Portrait of W. Blake” exhibited by “W. Fraser” at the Royal Academy in 1809.8↤ 8. The Exhibition of the Royal Academy, M.DCCCIX. The Forty-First (London: Printed by B. McMillan [for the Royal Academy, 1809]) 22, item 472, hung in the “Antique Academy” room (20). Fraser’s address is given as “17, Woodstock street, Bond street” (). I raise the issue here merely to dismiss it—or at least put it aside until the concluding paragraphs of this essay. Very little is known about William Fraser other than his exhibition of works at the RA. There is no record of contact between him and Blake, the RA catalogue gives neither the medium nor the size of the work, and it is possible that the “W. Blake” he pictured is not the poet and artist (see note 2 for other candidates). In these circumstances, further speculation would serve little purpose. 2. Blake, The Man Who Taught Blake Painting in His Dreams, Replica Perhaps by John Linnell. Pencil, 26.0 × 20.6 cm., based on Blake’s original, datable to c. 1819-20, with right and left reversed. Inscribed by Linnell lower left, “The Portrait of a Man who instructed Mr. Blake in Painting &c. in his Dreams,” and lower right, “Imagination of a Man whom. Mr Blake has recd. instruction in Painting &c from.” Butlin #755. Tate Collection, London. Blake’s original drawing is in the Keynes Collection, Fitzwilliam Museum, Cambridge (Butlin #753); a counterproof—with right and left reversed and probably the basis for this replica—is also in the Tate Collection (Butlin #754). begin page 130 | ↑ back to top than the 60-year-old whom Linnell met in 1818. The portrait next graced the cover of Johnson and Grant’s paperback selection of Blake’s works, justifiably one of the most frequently used classroom texts of his writings and designs. Johnson and Grant follow Bentley in attributing the portrait to “anonymous” and state that it represents “William Blake at about forty-five years of age.”10↤ 10. Mary Lynn Johnson and John E. Grant, eds., Blake’s Poetry and Designs, Norton Critical Edition (New York: Norton, 1979). The caption is printed on the back cover. The portrait is not reproduced in the hardbound issue. The portrait is also attributed to an “Anonymous Artist,” without reference to the date of execution or the age of the sitter, in [Gert Schiff], William Blake, catalogue of the exhibition at the National Museum of Western Art, Tokyo, 22 September through 25 November 1990 (Tokyo: National Museum of Western Art, 1990) caption to the illustrated “Reference Work” facing p. 5. The portrait was not included in the exhibition. The caption—a mini-essay of over 200 words—accompanying the reproduction of the portrait in Bentley’s 2001 biography, The Stranger from Paradise, deserves special attention.14↤ 14. G. E. Bentley, Jr., The Stranger from Paradise: A Biography of William Blake (New Haven: Yale UP, 2001) caption to plate 88. The same caption, with a different placement of one sentence, accompanies the reproduction in BR (2), plate 30. Bentley begins cautiously, placing a question mark after both “Blake” (as the subject) and “Self-portrait,” but these hesitations are allayed by what follows. “This strange portrait . . . surely represents William Blake,” for the coat, the “stock” or cravat, “the domed forehead, piercing eyes, arched eyebrows, and hair receding from a peak are very similar” to the 1807 portrait by Thomas Phillips,15↤ 15. Keynes 121-23 and plate 7. although that painting “shows a rounder chin, wider mouth, and greyer hair.” Bentley also compares the monochrome wash portrait to John Flaxman’s pencil sketch of Blake, dated 1804 on the verso, and finds that the two portraits are similar in “costume and hair peak,” but that the pencil drawing shows an “older and more solid” Blake.16↤ 16. Keynes 120-21 and plate 6. This portrait, and another pencil sketch by Flaxman of c. 1804 (Keynes 120 and plate 5), show a much fuller, heavier face in the cheeks and chin. Bentley concludes as follows: “The portrait was probably made by Blake when working on his portrait-miniatures about 1803. Notice the oval shape of the picture, traditional for miniatures . . . . The eyes, which to the self-portraitist are most conspicuous, are awesomely compelling. This is a portrait of Blake as he saw himself ‘not with but through the eye.’”17↤ 17. In his concluding phrase, bracketed with quotation marks, Bentley is adapting Blake’s line, “When we see [With] not Thro the Eye,” in “Auguries of Innocence.” See David V. Erdman, ed., The Complete Poetry and Prose of William Blake, newly rev. ed. (New York: Doubleday, 1988) 496, line 126 and the textual note on 860 (“With” is a deletion). Hereafter cited as “E” followed by page number. In William Blake and the Language of Adam, I reproduced the portrait but made no attempt to dissent from Butlin’s attribution.18↤ 18. Essick, William Blake and the Language of Adam (Oxford: Clarendon P, 1989) plate 2 and caption on p. ix (“Portrait of William Blake, perhaps by John Linnell after 1818”). The portrait is discussed on p. 7. My coeditor and I were similarly accepting of Butlin’s attribution in Blake in His Time, ed. Essick and Donald Pearce (Bloomington: Indiana UP, 1978) caption to the frontispiece (“Portrait of William Blake. Possibly by John Linnell”). Rather, my interest was in claiming that the face of Adam in Adam Naming the Beasts (illus. 3) is an idealized self-portrait. I’ll now reverse the direction of my argument and flesh out my earlier observations about the portrait drawing and its relationship to a painting indisputably from Blake’s hand. There are of course differences between the two works, including the youthfulness of Adam and the more elongated cheek and jawline in the drawing. The hair is different, yet Adam’s curly locks form a peak above his forehead, surround his head, and cover his ears much like the sparser hair in the portrait. The most striking similarities are the nose (particularly the bowed lower edges of the nostrils), eyes, eyebrows, and upper lip. Indeed, these features are almost identical in their stylization and an exaggerated symmetry unlikely to be found in any living face. 3. Blake, Adam Naming the Beasts. Tempera painting, 75.0 × 62.2 cm., signed and dated 1810. Detail of Adam’s face, approx. 38.0 × 34.5 cm. Butlin #667. Pollok House, Glasgow; copyright © Glasgow City Council (Museums). 4. Portrait of William Blake, verso pencil sketch. 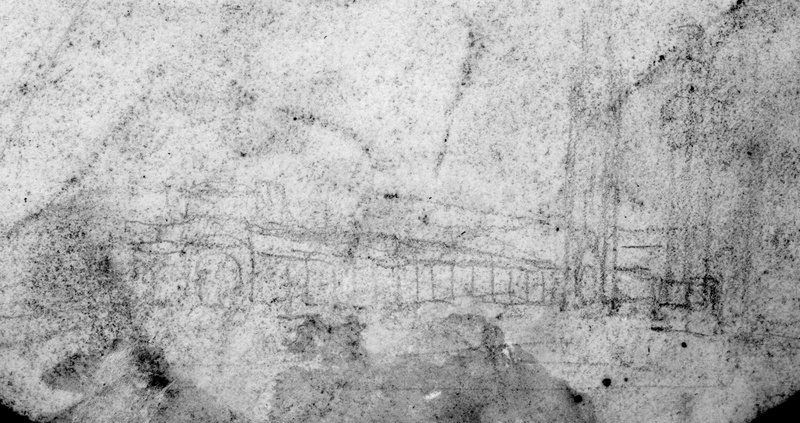 This rough sketch, only about 4.5 × 9.0 cm., is just above the lower edge of the sheet, with a top/bottom orientation the same as the recto portrait. Collection of Robert N. Essick. straight line between the lips; the mouth turns up in the Visionary Head. The eyebrows of the painting instructor rise at a slight curve from their inner termination, form a dramatic peak or angle a little more than halfway along their length, and then descend on a new curve toward their outer ends. In both the portrait drawing and the tempera, the eyebrows are a continuous curve throughout their entire span. Similarly, the upper eyelids of Adam and Blake lack the sudden angle of the instructor’s upper lids just before they arch over the pupils. In the portrayals of Blake and Adam, the outer corners of the eyes, particularly the left eye in each case, are drawn out into a thin line. No such extensions appear in the Visionary Head. Finally, the faces in the portrait and the tempera lack the phrenological segmentations so apparent in the instructor’s forehead.19↤ 19. For a study of the influence of this pseudoscience on the Visionary Heads, see Anne K. Mellor, “Physiognomy, Phrenology, and Blake’s Visionary Heads,” in Blake in His Time 53-74. If the portraitist had used one of Blake’s own works as a model, Adam Naming the Beasts would seem a better candidate than The Man Who Taught Blake Painting in His Dreams. Linnell may have seen the tempera while it was in the collection of Thomas Butts, but neither Butlin nor any other scholar has argued for its direct influence on the portrait.20↤ 20. The tempera painting was acquired, possibly as early as 1810, by Thomas Butts and was never in Linnell’s collection (see Butlin #667). One could go on and on with comparisons and contrasts among these three works (illus. 1-3). I trust it is already evident that such comparisons lead us not only to a common origin in Blake’s own features, but also to a similar manner of conceiving of and idealizing the human countenance. It is difficult to believe that two different artists designed and executed the portrait and the tempera painting, particularly if there is no evidence that the portraitist used the tempera as a model. The stylistic parallels between the portrait drawing and Adam Naming the Beasts suggest the presence of Blake’s hand as much as his face. 5. 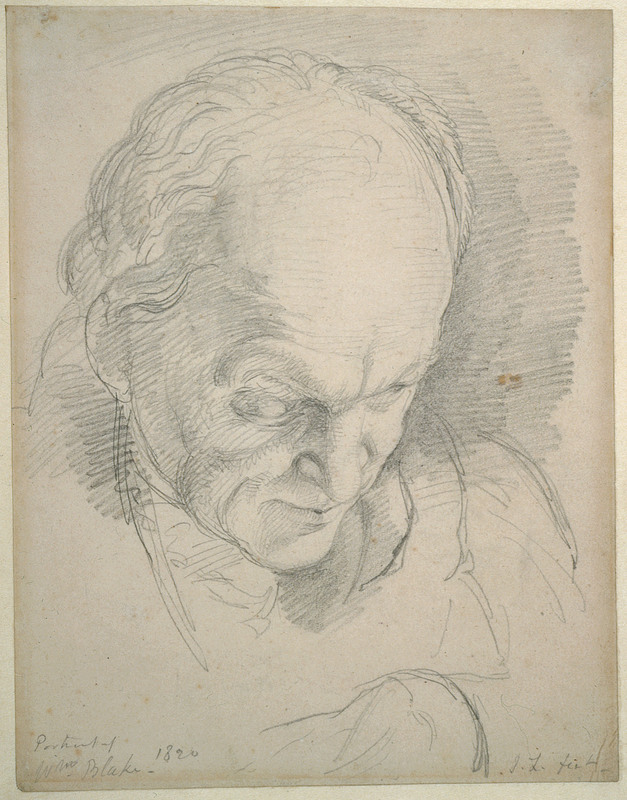 Portrait of William Blake, verso pencil sketch (see illus. 4). The pencil lines have been traced in black ink to distinguish them from accidental smudges, thereby highlighting the drawn image. the figure on the right may have its arms folded over its chest. Both figures seem disproportionately large in comparison to the structures—unless we imagine them standing well forward of even the nearest reaches of the building on the left. The artist has attempted linear perspective with mixed results. 6. John Varley (or Blake?). A Gothic Tower and Walls. Pencil, approx. 9.5 × 14.0 cm. Page 40 in the Smaller Blake-Varley Sketchbook. Butlin #692.40, where the sketch is attributed to Varley. Iris and B. Gerald Cantor Center for Visual Arts at Stanford University, 1971.57, Museum Purchase Fund. 7. John Linnell, Portrait of William Blake. Pencil on sheet 20.1 × 15.5 cm., signed with initials and inscribed “Portrait of Wm. Blake 1820.” Fitzwilliam Museum, Cambridge. drawings are similar in motifs and the awkward management of a pencil. But is the sketchbook example really by Varley? The drawings indisputably by Varley in the sketchbook were executed in chalk or soft pencil. Both yielded rather thick lines. The sketch on page 40 was made with a harder, sharper pencil of the sort we also find in Blake’s Visionary Heads on other pages. Varley’s architectural drawings are on rectos; page 40 is of course a verso. 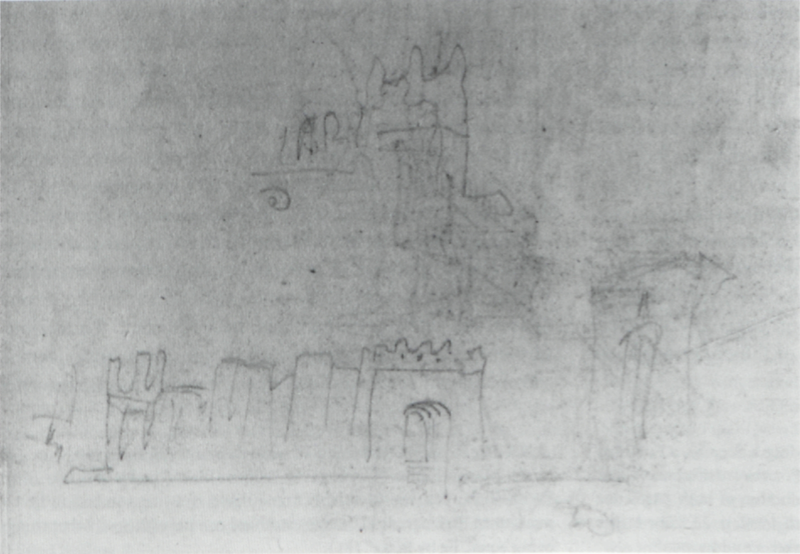 Drawings by Varley in the sketchbook offer fewer parallels with the composition on page 40 than the battlemented walls behind a crowned figure on page 74 of the Smaller Blake-Varley Sketchbook and a hesitant sketch of battlements accompanying the Visionary Head of James Hepburn, 4th Earl of Bothwell, on pages 27-28 of the Larger Blake-Varley Sketchbook. Both of these sketches have been confidently attributed to Blake.22↤ 22. Butlin #692.74 (“A Standing King Holding a Sceptre, a Fortified Town Behind,” in the smaller sketchbook). For the attribution of the drawing in the larger sketchbook and a reproduction of both pages, see Christie’s auction catalogue, London, 21 March 1989, p. 23. The larger sketchbook is now in the collection of Alan Parker, London. Several works by Blake, particularly among his Job illustrations of c. 1805-06,23↤ 23. The so-called “Butts Set” of watercolors; see Butlin #550. offer motifs reminiscent of the verso sketch on the portrait. Many of the Job compositions feature Job and his wife as two large foreground figures, distant hills or mountains, and architectural elements (including columns and in one design an arch) in the middle distance. 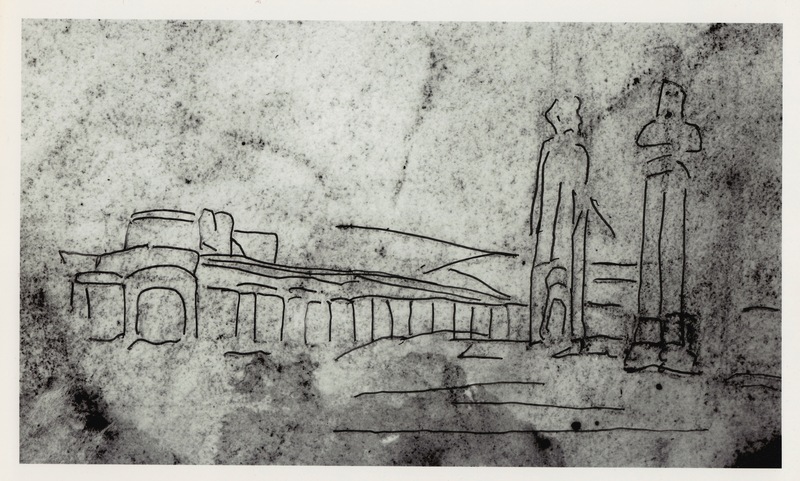 Pillar-like figures, such as the two in the verso sketch, can be found throughout Blake’s rougher pencil drawings. And was Varley ever quite so awkward, even in his hastiest doodles? To revise slightly one of Butlin’s own, only half-joking, methods for attributing a work to Blake, one can justifiably argue that a drawing too bad to be by, say, Linnell or Varley can nevertheless, other things being equal, be by Blake.24↤ 24. Martin Butlin, “Cataloguing William Blake,” in Blake in His Time: “With Blake, one can justifiably argue that a drawing too bad to be by, say, [John] Flaxman or [Thomas] Stothard can nevertheless, other things being equal, be by Blake” (81). An attribution of the portrait’s verso sketch to the man whose likeness commands the recto would not be unreasonable. Perhaps the begin page 135 | ↑ back to top same ascription could be mooted for the composition on page 40 of the Smaller Blake-Varley Sketchbook without provoking guffaws. At the very least, the sketchbook drawing is a questionable touchstone for attributing the portrait’s verso design to Varley. The watermark recorded in Christie’s auction catalogue has heretofore been assumed to be accurate. Only the word “PINE” and the date are clearly visible because of dark washes to the left of that word. Careful inspection with a strong backing light reveals the full watermark to be “[E]DMEADS & PINE / 1802,” with what must surely be the first letter of the first word trimmed off by the edge of the sheet.25↤ 25. I am grateful to Alexander Gourlay for suggesting the possibility that the watermark has been consistently misread. Blake used papers produced by Edmeads and Pine in many of his illuminated books printed in the 1790s. An “EDMEADS & PINE 1802” watermark appears in copies P and Q of Songs of Innocence, both printed in 1804; the same “EDMEADS & PINE / 1802” watermark of the portrait appears in three proof impressions of plates from Jerusalem (possibly among those printed in 1807) in the Pierpont Morgan Library, New York.26↤ 26. See Bentley, Blake Books 226, 366 for these watermarks. Copy designations for the illuminated books follow Bentley. For printing dates, see the chart in Joseph Viscomi, Blake and the Idea of the Book (Princeton: Princeton UP, 1993) 376-81. The wove paper on which the portrait was drawn is a type Blake used frequently over many years. In his essay on the portrait, Butlin warns us against assuming that the watermark establishes a date of composition by pointing out the gap between the 1806 watermark in the Smaller Blake-Varley Sketchbook and Blake’s first use of it c. 1819. That case is not quite equivalent, however, since Varley may have used the sketchbook many years earlier for his own drawings. The main issue, however, is not the watermark date of the portrait but the apparent age of the sitter. Although Blake, because of the fuller cheeks and chin, looks somewhat older in the Flaxman portraits of 1804 (see note 16), he looks a great deal older in Linnell’s 1820 portrait (illus. 7—compare to illus. 1). The hairline has receded considerably, the wrinkles increased. All of Linnell’s other portraits of Blake show a man at least as old.27↤ 27. See the portraits datable to c. 1820-21 in Keynes 135-39 and plates 25, 26, 28-33. All these portraits share the conceptual orientation exemplified by illus. 7. Linnell’s fine work also indicates his typically naturalistic way of conceiving of and rendering the human face, so distinctly different from the wash portrait. He gives us Blake’s physical face as he saw that face with his physical eyes at a specific moment in the sitter’s life, the head and light at specific angles. This face is set fully in time and space as we experience them in our daily lives. Nothing could be further in conception from a “Spiritual Form” (Butlin) seen “not with but through the eye” (Bentley). Even if The Man Who Taught Blake Painting in His Dreams served as his model, could Linnell so thoroughly hide any trace of his very different sensibility as a portraitist, and at the same time make Blake look far more youthful than he was when Linnell knew him? According to several people who knew Blake, his eyes were his most prominent feature. For Frederick Tatham, Blake’s “Eye” was “most unusually large & glassy, with which he appeared to look into some other World” (BR  684). Samuel Palmer was equally impressed: “His [Blake’s] eye was the finest I ever saw: brilliant, but not roving, clear and intent, yet susceptible; it flashed with genius, or melted in tenderness. It could also be terrible.”28↤ 28. BR (2) 392. See also Alexander Gilchrist’s 1863 description of Blake’s eyes, very probably based on reports from those who knew him: “His eyes were fine—‘wonderful eyes,’ some one calls them; prominently set, but bright, spiritual, visionary; not restless or wild, but with ‘a look of clear heavenly exaltation’” (BR  390). As Butlin, Keynes, and Bentley have noted, the wash portrait captures this reported intensity of Blake’s actual gaze.29↤ 29. They describe the “intense gaze” in the wash portrait (Butlin in Blake Studies 101), the “penetrating gaze” (Keynes 24 and 140), and the “piercing eyes” (Bentley, caption in Stranger from Paradise). To such observations Bentley, in his caption in Stranger from Paradise, adds the idea that self-portraiture contributes to a concentration on the eyes. A survey of self-portraits from the Renaissance through the twentieth century supports Bentley’s claim, particularly in the case of full-frontal self-portraits.30↤ 30. Among British artists, see, for example, the self-portraits by John Ruskin, Aubrey Beardsley, Stanley Spencer, Jacob Epstein, and David Hockney, all conveniently reproduced and discussed in The Artist by Himself: Self-Portrait Drawings from Youth to Old Age, ed. Joan Kinneir, intro. David Piper (New York: St. Martin’s P, 1980). As the artist/subject studies his face in a mirror, the eyes open more widely than normal and intensify, becoming fixed on their own reflection. A striking example from the circle of Blake’s so-called “followers” is Samuel Palmer’s self-portrait now in the Ashmolean Museum, Oxford.31↤ 31. Dated to c. 1826 and reproduced in Raymond Lister, Catalogue Raisonné of the Works of Samuel Palmer (Cambridge: Cambridge UP, 1988) 55, #63. Several similarities between Palmer’s self-portrait and the Blake wash portrait might even lead one to speculate that Palmer saw and was influenced by the latter. The representation of the eyes in the wash portrait of Blake may be in part the product of how those eyes looked not to others—but to themselves in a mirror. If we provisionally place the wash portrait in the context of Blake’s life a few years before and after the watermark date, when he was in his mid-40s, we find a context of work and thought in which self-portraiture seems more likely than at any other period in his life. During his years in Felpham under William Hayley’s often burdensome patronage, 1800-03, Blake was involved in the art of portraiture to a surprising extent. Even before Blake’s arrival, Hayley had commissioned him to engrave a portrait medallion of Hayley’s natural son, Thomas Alphonso, as an illustration for Hayley’s Essay on Sculpture, published in 1800. Once in Felpham, Blake soon began to execute a series of 18 tempera paintings, the so-called “Heads of the Poets,” to decorate Hayley’s library (Butlin #343, dated to c. 1800-03). Although these works are elongated begin page 136 | ↑ back to top rectangles, the portraits themselves are set within circular or oval framing motifs. Blake’s engravings for Hayley’s Life, and Posthumous Writings, of William Cowper, published in 1803-04, include three portraits.32↤ 32. For reproductions, descriptions, and an overview of the documents relating Blake’s considerable labors on these portraits, see Essick, William Blake’s Commercial Book Illustrations (Oxford: Clarendon P, 1991) 85-90 and figs. 199-202. Preparatory to his execution of one of these, a portrait of Cowper after a pastel by George Romney, Blake carefully copied Romney’s work (illus. 8). As I briefly noted in the 1987 exhibition catalogue mentioned earlier, this pen and wash drawing exemplifies Blake’s habits when copying a portrait and offers some significant parallels with the wash portrait of Blake. \ 8. 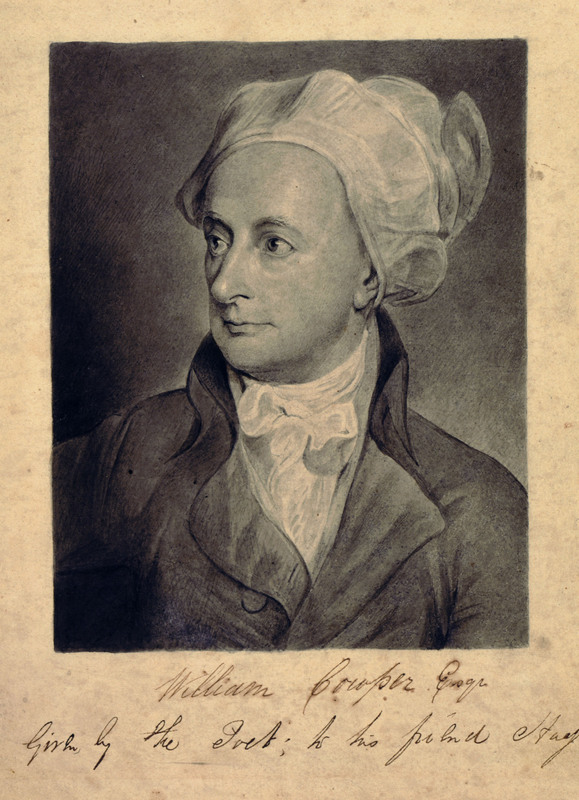 Blake, Portrait of William Cowper after Romney. Pen and washes, approx. 18.8 × 14.7 cm. Inscribed by William Hayley, “William Cowper Esqr / Given by the Poet; to his friend Hayley.” Butlin #351, where the drawing is dated to c. 1801 (the engraving of the same portrait is dated November 1802 in its imprint). As Butlin notes, Hayley’s inscription “would rule out Blake’s participation but presumably is the result of a later confusion with Romney’s original.” Lessing J. Rosenwald Collection, Library of Congress, Washington, DC. 9. 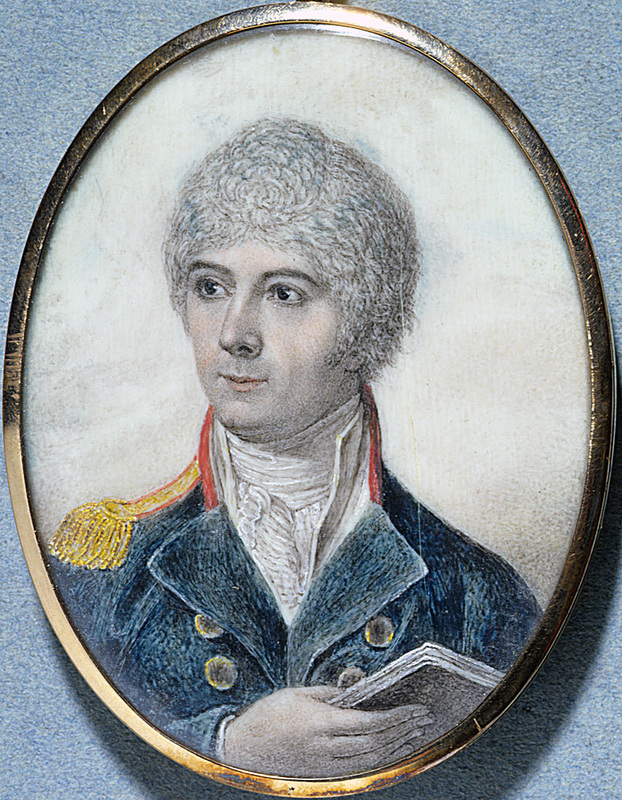 Blake, Miniature of Thomas Butts. Watercolor on ivory, oval, 8.4 × 6.3 cm. Butlin #376, where the painting is tentatively dated to “1801(? ).” British Museum, London. begin page 137 | ↑ back to top already reduced to the two dimensions of canvas or paper, rather than a living face in three dimensions. But a version of this same perceptual and compositional situation also pertains if Blake is copying his own face represented in a mirror. In earlier publications, Bentley and I have independently related the wash portrait of Blake to his learning miniature portraiture. This context deserves more consideration. In a letter to Romney of 3 February 1801, Hayley states that he has “taught Him [Blake] he says to paint in Miniature, & in Truth he has made a very creditable Copy from yr admirable Portrait of the dear departed Bard [Cowper].”34↤ 34. BR (2) 104. The “Copy” to which Hayley refers is probably one of Blake’s two miniatures of Cowper (Butlin #353-54), or, just possibly, the wash portrait reproduced here (illus. 8). Hayley was himself not a miniaturist; as he implies in a letter to Romney of 21 April 1801 (BR  106-07), Blake probably learned the rudiments of the art from Jeremiah Meyer, a friend of Hayley’s and miniature painter to the Queen. *↤ * Correction by Robert N. Essick (Spring 2006): Jeremiah Meyer died in 1789, and thus Blake’s instructor must have been Jeremiah’s son, William, also a miniaturist. [e] Blake apparently began this new endeavor with enthusiasm: “my present engagements are in Miniature Painting Miniature is become a Goddess in my Eyes & my Friends in Sussex say that I Excell in the pursuit” (10 May 1801 letter to Thomas Butts, E 715). The miniatures Blake painted—at least nine in all, of which six are extant—are hardly masterpieces in the genre, but all follow its conventions dutifully. His portrait of Thomas Butts nicely exemplifies the lot (illus. 9). The oval shape and small size are of course standard, as are the detailed rendering of the face and broader brushwork on the costume. Even the looser handling of the hair is typical of late eighteenth- and early nineteenth-century miniatures. The face is executed, as in so many miniatures of the period, with very short, stipple-like strokes of a small, pointed brush.35↤ 35. This combination of techniques is typical of the influential miniatures of Richard Cosway (1742-1821), who “worked carefully with stipple in the features, but adopted a romantic sketchiness in his linear handling of hair, costumes and background . . . .” Quoted from Jim Murrell, “The Craft of the Miniaturist,” in John Murdoch, Murrell, Patrick J. Noon, and Roy Strong, The English Miniature (New Haven: Yale UP, 1981) 19-20, where George Engleheart is also described as using similar styles. See also Murrell’s comment that Ozias Humphry, who commissioned the “Small” and “Large” Books of Designs from Blake, “usually finished his miniatures with careful stippling” (19). According to Christopher Lloyd and Vanessa Remington, “the stippling process [in portrait miniatures] is, in fact, not unrelated to contemporary engraving techniques in seventeenth-century France” (Masterpieces in Little: Portrait Miniatures from the Collection of Her Majesty Queen Elizabeth II [London: Royal Collection Enterprises, 1996] 28). Blake was an expert stipple engraver; see, for example, his “Venus Dissuades Adonis from Hunting” after Cosway (1787) and his engraving of “Mirth” after his own design (first state, c. 1816-20). These and other works in stipple are described and reproduced in Essick, The Separate Plates of William Blake: A Catalogue (Princeton: Princeton UP, 1983). By early 1803, Blake’s growing disenchantment with Hayley and his assignments included a turn against portraiture. As he told his brother James, “he [Hayley] thinks to turn me into a Portrait Painter as he did Poor Romney, but this he nor all the devils in hell will never do” (letter of 30 Jan. 1803, E 725). In spite of this attitude, Blake continued to practice miniature painting, for he inscribed his miniature of Mrs. Butts “1809” (Butlin #377), and the portrait of Thomas Butts, Jr., probably also dates from that year (Butlin #378). Painting with stipple-like strokes also appears to have influenced the hand coloring of post-1800 printings of Blake’s illuminated books. Alexander Gilchrist describes Blake’s “finishing the plates like miniatures” in one such copy of Songs of Innocence and of Experience (BR  207). In 1809, Blake claimed that his own “fresco” paintings are “properly Miniature, or Enamel Painting; every thing in Fresco is as high finished as Miniature . . . .”36↤ 36. Advertisement for “Exhibition of Paintings in Fresco, Poetical and Historical Inventions” (E 527). See also Blake’s annotation to Joshua Reynolds’ Discourses: “Fresco Painting is Like Miniature Painting; a Wall is a Large Ivory” (E 653). As for portraiture in general, the many Visionary Heads of c. 1819-25 testify to Blake’s continued interest in a special form of that art. Finally, we have Tatham’s testimony that Blake’s concluding act as an artist, in the last few hours of his life, was to draw a portrait of his beloved wife Catherine (BR  682). Returning to the wash portrait of Blake (illus. 1), we can find in it many characteristics of miniature, even if the size might seem to exclude it from that category.37↤ 37. In the nineteenth century, so-called “miniatures” tended to increase in size; see, for example, Robert Thorburn’s 32.4 × 26.0 cm. stippled painting, Queen Victoria and Edward Prince of Wales of c. 1845. Even some earlier miniatures were only a little smaller than the Blake wash portrait—e.g., Richard Crosse’s 17.4 × 13.3 cm. Mrs. Siddons of 1783. Both are reproduced in Murdoch et al. Bentley has pointed to its oval shape, so characteristic of miniatures. It is of course possible that someone cut it to an oval after the drawing left the artist’s hands, but the shadow on the right and the framing of the costume make it difficult to imagine how the image could have looked anything other than awkward if extended to four corners. Blake’s arms, for example, would reach almost to the elbows and be oddly cut off at that point. Even the direction of the soft lighting, coming from left to right, bespeaks miniaturist conventions.38↤ 38. See Lloyd and Remington: “Assuming the artist to be right-handed, the light was admitted from the left” (27). The most telling feature is the use of fine, stipple-like brushstrokes to represent the contours of Blake’s face. As in the miniature of Butts (illus. 9), the hair and costume are handled more freely. The artist who produced the wash portrait was influenced by the styles and techniques of miniature portraiture that Blake had learned while in Felpham. I trust that my observations and arguments to this point, coupled with the comments by Bentley and others I’ve summarized, can lead us all to agree that the Scottish verdict of “not proven” is an appropriate response to Butlin’s attribution of the wash portrait to Linnell. I suspect, however, that many may find the same verdict justified in regard to my attribution to Blake. One feature of the portrait will tip the scales away from Linnell, Fraser, or anyone else other than Blake himself. 10. James S. Deville, Life Mask of William Blake. Plaster, surface partly gilt. Head, measured face-on, approx. 19.5 × 14.0 cm. A copy mold-made from the original in the National Portrait Gallery, London. Original incised “PUBD AUG. 1, 1823” on the back of the neck. Collection of Robert N. Essick. To paint a self-portrait, one must look into a mirror (as I’ve already noted in passing, without attention to all the implications). It is of course possible for someone to paint a mirror image of another’s face, but this is an exceedingly remote possibility in the present instance. A mirror image is subject to “bilateral inversion”—that is, the reversal of right and left. David Piper has described the situation adroitly: ↤ 39. Introduction to The Artist by Himself 12. Perhaps Piper overstates the two-dimensional qualities of a mirror image. It projects a sense of depth greater than a work on paper. Can we find in the wash portrait of Blake, in spite of its stylized symmetry, any asymmetrical features that are inverted in comparison to other representations of his face?40↤ 40. Blake’s coat shows no bilateral inversion, for the left side overlaps the right side, as is standard for men’s coats. I suspect that the costume was drawn freely, without any reference to a mirror reflection. If a self-portrait, Blake was probably not wearing his formal coat and cravat while composing the work. Some of the self-portraits reproduced by Kinneir show a reversal of the conventional overlapping of shirts or coats; others do not. To answer that question, we will need a picture of Blake’s face as free as possible from stylistic distortions. 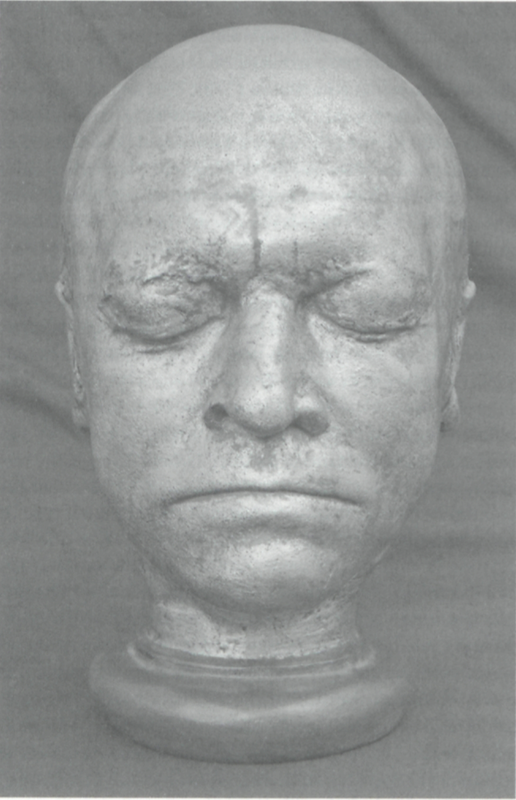 His life mask, mold-made in three dimensions by the phrenologist James S. Deville from Blake’s head in the summer of 1823, offers the best possibilities (illus. 10).41↤ 41. The casts in the Fitzwilliam Museum, Cambridge, and the National Portrait Gallery, London, appear to have been made from the original mold. Keynes illustrates the Fitzwilliam cast, plates 23a-b, and a facsimile mold-made from the National Portrait Gallery cast, plates 23c-d. The illustrations here (illus. 10-12) are photographs of another one of these second-generation facsimiles. None of these moldmaking and casting procedures reverses right and left. As Keynes notes, the Fitzwilliam cast “is unsigned and seems unfinished, the surface being rough and somewhat mottled. It is, so to speak, a ‘proof’ copy, or prototype” (133). The National Portrait Gallery cast “has a cleaner and smoother surface and is signed on the back of the neck representing Deville’s finished intentions, such as he would have sold to his customers, though only one example is known to have survived” (133). Such works create their own distortions, for the drying plaster has pulled down the corners of Blake’s mouth, giving him a stern and pained expression, and flattened his nose a little. Straws or tubes of some sort were very probably inserted into Blake’s nostrils so that he could breathe while the plaster dried. A life mask, however, does not create (or erase, in deference to vanity) wrinkles and creases, nor does it reverse asymmetries. The life mask shows that Blake had a very symmetrical face. Only two right/left differences are clearly evident. I suspect that the use of breathing straws and the flattening of Blake’s nose have flared his nostrils unnaturally, but this distortion helps reveal a difference in the “cut” or shape of the lower edge of each nostril (technically, the ala nasi) that could not have been created by the mold-making procedure. The right nostril (on the viewer’s left) rises at a steeper angle from the tip of the nose than the left nostril (illus. 11, top). The right is more arched, and gives the appearance of being slightly higher than the left. 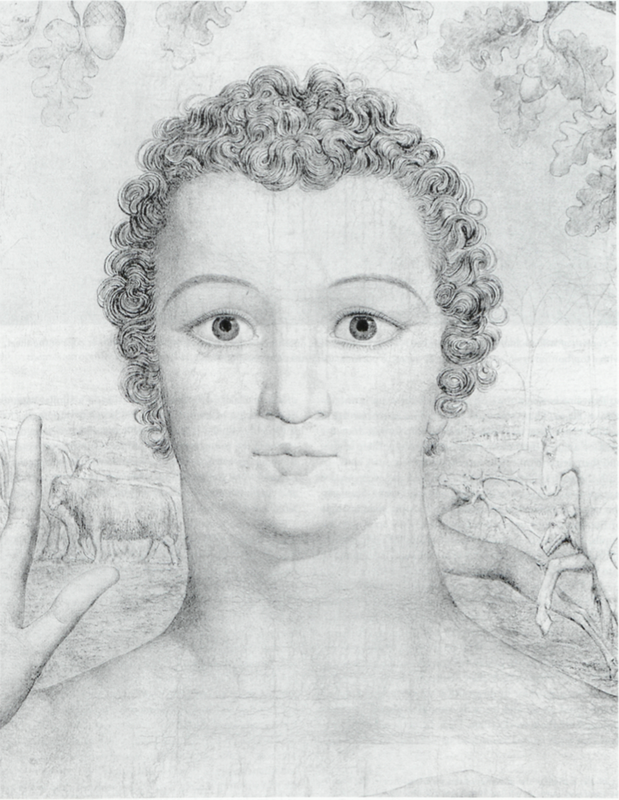 A more prominent asymmetry is the deep crease in Blake’s forehead that begins vertically, above his nose just left of center from the viewer’s perspective, and then arches horizontally to our left (that is, over Blake’s right eye) with begin page 139 | ↑ back to top perhaps a much less visible branch to the right (illus. 12, left). Linnell pictures this same crease in his 1820 drawing of Blake (illus. 7), although with less precision than the life mask. If we now turn back to the wash portrait, we can see these same features—but reversed. The artist has made the nostrils more symmetrical than the life mask reveals they actually were, just as he has almost certainly made the mouth, eyes, and eyebrows more symmetrical than we are likely to find in any living face. Further, the light coming in from the left side of the drawing casts Blake’s left nostril in shadow. 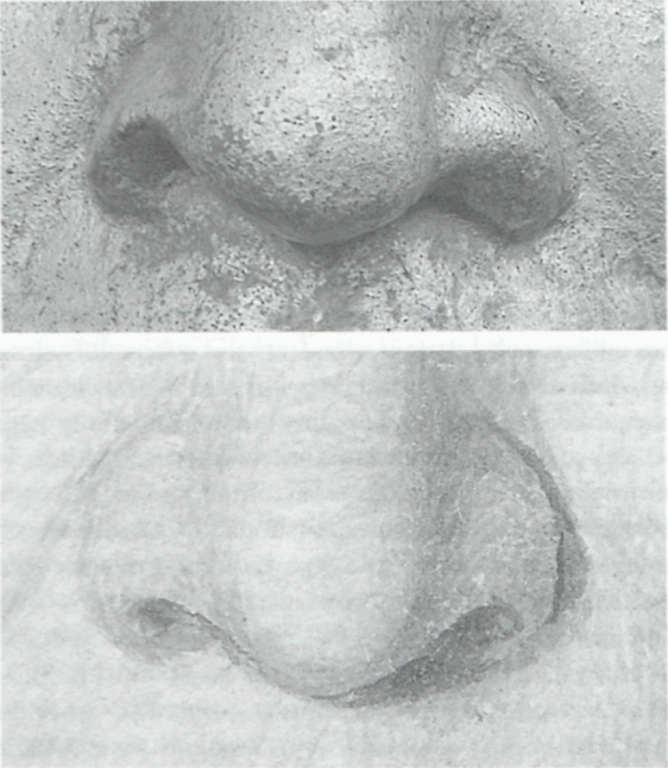 In spite of these stylistic features, we can still see that the angle at which the left nostril (on the viewer’s right) rises from the tip of the nose is steeper than the same portion of the right nostril (illus. 11, bottom). Recall that this reverses the nostril asymmetry in the life mask (illus. 11, top). 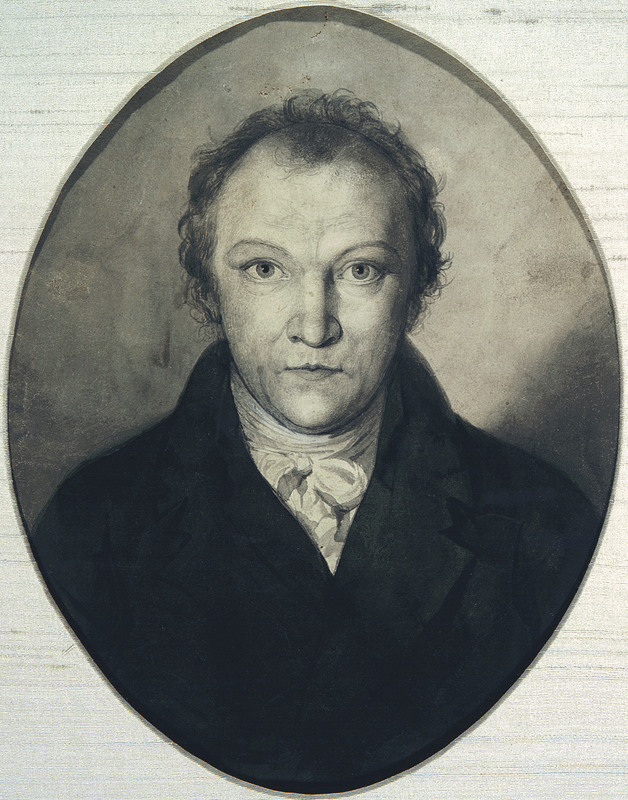 The forehead crease begins vertically just right of the center of Blake’s nose and arches horizontally to our right—that is, over Blake’s left eye in the wash portrait (illus. 12, right). Again, the reverse of the life mask (illus. 12, left). The artist who drew the wash portrait was looking at Blake’s face in a mirror. That artist was William Blake. The sojourn in Felpham and the decade following were for Blake years of psychological turmoil and introspection. Those experiences found expression in some of his greatest works, including Milton a Poem, with its meditations on the nature of the human self in all its conflicted complexity. His self-portrait emerged from this same context and is, quite literally, a self-reflection. It is a continuation of his long-standing interest in physiognomy, a supplement (as it were) to the “Heads of the Poets,” and a prelude to (not a copy of) the Visionary Heads. Blake found a “Divine countenance in such men as Cowper and Milton” (letter to Hayley of 28 May 1804, E 750). Through an idealizing transformation of his own face, Blake attempts to articulate a similar union of the physical and the spiritual/imaginative (the two being one in Blake’s thought). In “A Vision of the Last Judgment,” he asks the viewers of his painting to “attend to the Hands & Feet to the Lineaments of the Countenances they are all descriptive of Character” (E 560). Through self-portraiture Blake attends to the character of his own countenance and thereby follows his advice in Milton: “Judge then of thy Own Self: thy Eternal Lineaments explore” (E 132). The self-portrait is Blake’s most direct and personal attempt to “leave” for us his “destind lineaments permanent” even as the “generations of men run on in the tide of Time” (Milton, E 117). 11. Top: detail of the nostrils in Blake’s life mask, illus. 10. Bottom: detail of the nostrils in the wash portrait of Blake, illus. 1. 12. Left: detail of the right forehead (viewer’s left) in Blake’s life mask, illus. 10. Right: detail of the left forehead (viewer’s right) in the wash portrait of Blake, illus. 1.